Protect your table top from sharp blades, writing instruments and other art and craft tools. 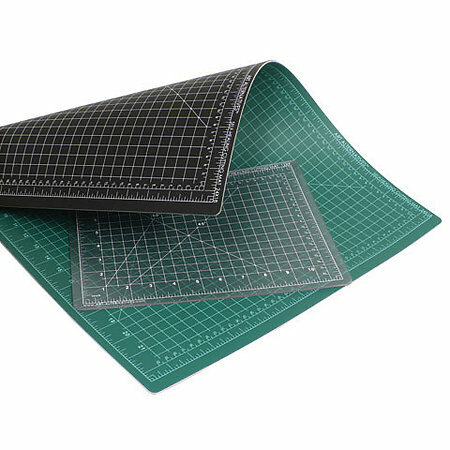 These 3mm thick PVC mats feature a durable 5-layer construction, a non-slip, non-glare surface, 1/2" grid with 1/8" marks for precise alignment as well as 45í and 60í guides. Resilient self-healing surface won+t break down with repeated use and actually prolongs the life of knife blades. The green/black mats are reversible with grid markings on each side. The clear mats are crystal clear and are great for use with a light box.